Pulmonary arterial hypertension (PAH) is a serious life threatening disease that leads to right heart failure and death. Elevated pulmonary vascular resistance (PVR) is the main pathophysiological component that leads to elevated pulmonary arterial pressures and increased right ventricular afterload. Increased PVR is related to different mechanisms that include vasoconstriction, proliferative and obstructive remodeling of the pulmonary vessel wall and in situ thrombosis. Numerous molecular, genetic and humoral abnormalities have been proposed to play an important role in pulmonary vasoconstriction and remodeling. 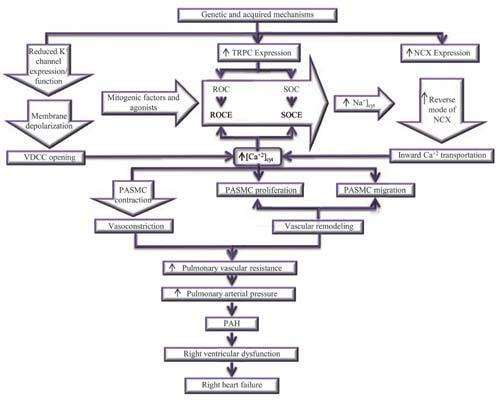 Of those, calcium (Ca+2) is a well recognized parameter involved in the pathogenetic mechanisms of PAH, because of its twofold role in both vasoconstriction and pulmonary artery smooth muscle cell (PASMC) proliferation. The aim of this review is to focus on Ca+2 handling and dysregulation in PASMC of PAH patients. Calcium handling, pulmonary arterial hypertension, vascular proliferation, vasoconstriction, calcium signaling, intracellular calcium handling, intercellular calcium handling. Third Department of Cardiology, Ippokrateio General Hospital, Medical School, Aristotle University of Thessaloniki, Konstantinoupoleos 49, 54642, Thessaloniki, Greece.